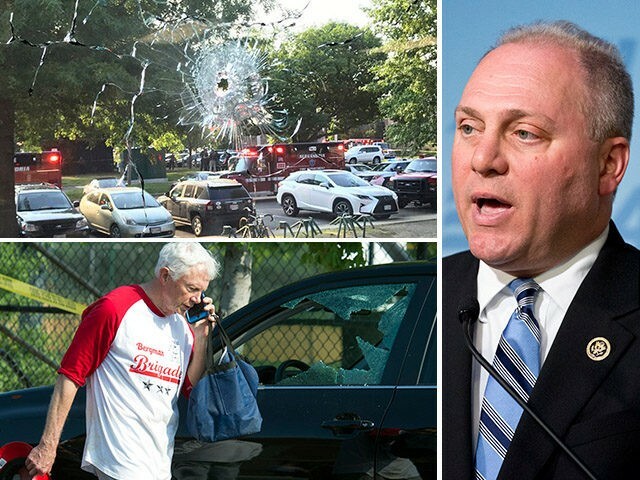 A gunman opened fire wounding five as the Republican Congressional Baseball team began practice Wednesday morning at Simpson Park in Alexandria, Virginia. Up to 25 members of Congress, both Democrats and Republicans, gathered to enjoy the beautiful morning and play a little baseball ahead of this week’s charity game set to raise money for the Boys and Girls Club of Washington DC. The shooter, armed with an AK-47 styled rifle and a pistol, entered a dugout and began firing at about 7:15 AM, firing perhaps as many as 50 shots according to Fox News. Members of the Capitol Hill Police arrived in less than five minutes and returned fire, wounding the attacker and ending the assault. GOP Majority Whip Steve Scalise (R, LA), and at least one staffer were shot. Rep. Roger Williams (R, TX) was also injured, but not shot, during the attack. Also, two members of the Capitol Police were injured. A total of five were transported to the hospital. Rep. Mo Brooks (R, SC) described the scene to Fox News. The Vice President and I are aware of the shooting incident in Virginia and are monitoring developments closely. We are deeply saddened by this tragedy. Our thoughts and prayers are with the members of Congress, their staffs, Capitol Police, first responders, and all others affected. There is still no word on the motive of the shooter. He has also not yet been identified.